On Friday I took the kids to our homeschooling group’s annual Lenten retreat. The theme of this year’s retreat was The Seven Sorrows of Mary. A young priest, Fr. Anthony Cusak, (himself a homeschool graduate) gave a meditation for the mothers that was just beautiful. As he spoke of the Flight into Egypt he referenced a painting at the MFA. I knew I needed to go look up the painting and also that I needed to go look up art to go with all the sorrows and to post them here with some of what I remember from his talk and some of my own thoughts and reflections. So here is the fourth of a planned series of seven posts: First: The Prophecy of Simeon, second: Flight into Egypt, third: The Loss of the Child Jesus in the Temple. “And there followed Him a great multitude of people, and of women, who bewailed and lamented Him.” – Luke 23:27. 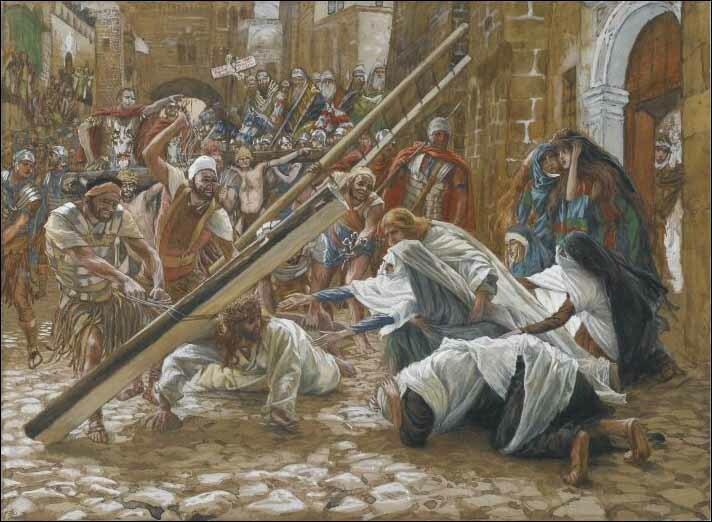 The meeting between Jesus and his mother on the way of the cross is not recorded in any of the Gospels, but we know that there were women who followed him on the way and we know that Mary was at the foot of the cross with St John, so it isn’t unreasonable that she and Jesus should have met as he was carrying the cross. It is also a strong tradition of the Church, commemorated both in the devotion of the Seven Sorrows of Mary and in the Stations of the Cross. For me this is the hardest sorrow to explicate, just because it is so clear on the surface how Mary suffers. She suffers because she has to stand by and watch her only child suffer. She sees not only his physical suffering, the result of the beatings he’s received, the heaviness of the cross, the many times he falls. She also hears the jeering of the crowd, and every cruel word cuts to her own heart. But the suffering she endures is not only her maternal reaction– That’s my son, you’re calling names! — it’s also her pious heart aching at the blasphemy and hatred they are directing toward their Savior, toward the second person of the Trinity, the only begotten Son of God. For if Mary did not fully understand his mission at first, I think it’s clear that by the time of the crucifixion all her years of pondering have borne fruit. She understands, perhaps more clearly than anyone except Jesus himself, who he is and why he has come. This is the woman who told the servants at Cana, “Do whatever he tells you.” She has seen his deeds, heard his words, and she is in a better position than anyone to understand what it all means. She who is the ark of the new covenant, whose son was conceived by the Holy Spirit. She who Gabriel called “full of grace.” She the sinless one. How much must it have hurt her to see her people turn against their God? In Lorenzetti’s beautiful Road to Cavalry an armored Roman soldier physically bars the weeping Mary from approaching her son. His shield raised, he pushes her back, leaning into her. Look at the angle of his legs and with what force he is shoving at her! Jesus doesn’t even turn to meet her. His back to his mother, he carries his cross steadfastly, eyes ahead, focused on his mission. To make their separation even more complete, a second soldier stands at Jesus’ back, his shield pressed against Jesus. How much must it hurt Mary to be prevented from drawing close to her son, from offering him comfort? How hard is it when we must watch a loved one suffer and we can do nothing to offer them relief. When they seem oblivious even to our presence, we might be tempted to despair, to give up the effort as worthless. But surely Jesus is aware of Mary’s presence. And surely she does bring him comfort and consolation in that dark hour. Although at the same time, his heart must have been breaking to see his dear mother suffer so. 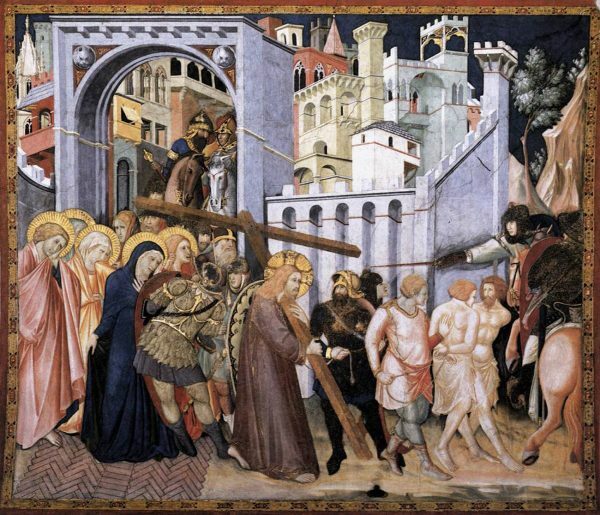 In Andrea di Bartolo: Way to Calvary an anguished Mary stretches out her hand towards her son. She almost looks as if she is trying to help raise up the weight of the cross. Here, although a soldier tries to push him forward, Jesus turns to look back over his shoulder. He gazes lovingly at his mother and does not turn away his face. The detail I love most in this crowded scene is the soldier who here bars Mary’s way. His lifted arm holds a sword which he aims at her breast. Here di Bartolo gives us a literal depiction of the sword aimed to pierce her heart. Tissot’s dynamic depiction of Jesus meeting his Mother is a much more modern, more emotional treatment of the subject. 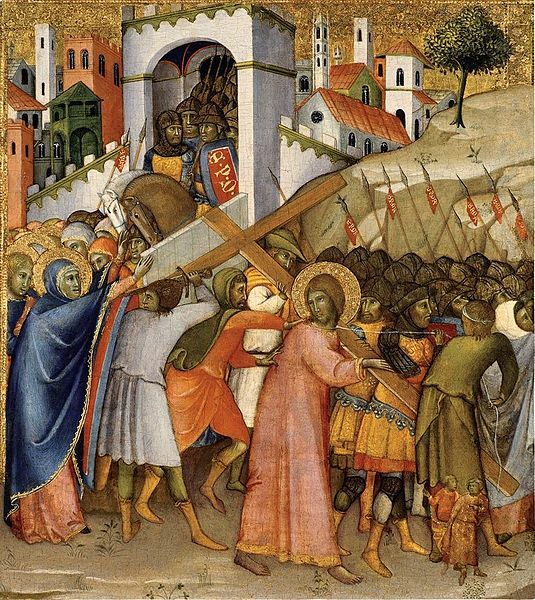 Jesus has fallen under the weight of the cross; a Roman soldier attempts to hoist it with a rope. Mary reaches toward him, her hands almost touching him. She leans in, restrained by John, whose arms encircle her waist. It looks like she would surely fall without his support. Behind him the crowd leers, a soldier mockingly holds forth the nails, showing them to the fallen Christ. But Jesus is looking at his mother. In his meditation Father Anthony called to mind the treatment of this scene in The Passion of the Christ. As Mary sees Jesus fall we flash back to a time when Jesus fell as a young boy. She rushes forward to comfort him, calling, Here I am. Here I am, Mary calls. Who is the comforter and who the comforted in this scene? Both suffer, both seek to console the other. They are united in their suffering, the Mother feeling every blow that the Son feels, every insult, every pain. They both suffer the anguish of being kept apart, of being forced to witness the other’s suffering. Here I am, she cries, the mother seeking to comfort her baby; but her words also echo the words with which Eli instruct young Samuel in the Temple to answer when God calls him in a dream: Here I am. I come to do your will. Here I am. Abraham says it. Jacob says it. And Joseph and Moses and Isaiah. Here I am. Mary and Jesus are united not only in suffering and sorrow, but also in obedience and consent. They have both heard the call and answered it. Here we see Mary’s fiat come to its climax. Here she renews it once again. She could have run. She could have hid. She could have stayed home. But instead: Here I am.